Description: As the growing conflict forces Logan to embrace his newly discovered heritage, he fights to control a power he has long kept buried—a power that threatens everything he has tried to make of himself. Desperate to spare Astarti yet another burden, he tries to hide his crumbling control, but she has long since learned to recognize a lie. As Logan becomes a danger to himself and those around him, Astarti must find a way to help him, even if he doesn’t want it. Unfortunately, Astarti has other problems. Good and evil wear ever-shifting faces, the right course of action grows increasingly unclear, and the stakes are only getting higher. In this final installment of The Griever’s Mark trilogy, Astarti must decide, once and for all, what she stands for--and what she is willing to sacrifice. 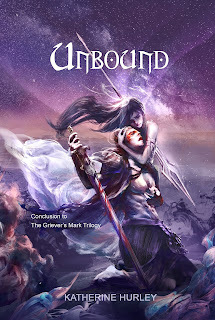 Unbound by Katherine Hurley is the thrilling conclusion to The Griever's Mark Trilogy. Everything about this series has been quite unique and adventurous from book 1 all the way till book 3. The characters were well written, and the story line was something else. I would give Unbound a 10 out of 10 rating. The thing I liked the most about this book, was that it was such a well balanced conclusion to the trilogy. It was nicely paced, and spaced out. There were some new elements brought to the table in Unbound, but nothing felt rushed or went unexplained. I also liked that every detail had a purpose or greater meaning. 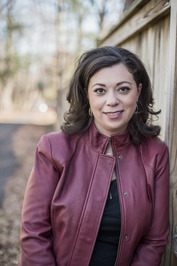 Since the beginning, I have quite enjoyed the magic system that Katherine Hurley developed. It was a different sort of elemental magic system that I quite enjoyed learning and reading about. I think I especially enjoyed the Drifter's magic and the way you could Drift up weapons. That was a neat aspect portrayed. I loved, loved, loved Logan and Astarti. They were probably my favourite characters, aside from Horik. Astarti was such a wonderful female protagonist. She was strong willed and always did her own thing. She made decisions with not only her head but with a combination of her heart as well. It was inspiration to see the way Logan grew to trust full heartily. I mean yes, Logan always said he did, but as a reader I could tell when he actually changed and began doing what he was saying. It was really nice and see that. Out of all the character development, I LOVED Logan's the most. Maybe it's because I am a little bias because he is such a wonderful book boyfriend to have on my very long list, or maybe it's just because his development was that great. I saw so much change in him in areas I didn't think needed improving. It was also fun to read about him beginning to control the full of his magic towards the end of the story. Last but certianly not least, I must mention Horik. I loved Astarti and Horik's friendship. It was so geniuning and sweet. There is a scene towards the end of the book that involves Horik making a quick descision and in the process he saves Astarti instead of someone else and it made my heart melt. I don't want to giveaway any spoilers, but wow it made my heart melt. Overall, it was really hard not to mention each character and state the things that made me love them. I don't think there was one character who I disliked. I mean sure, there were the antagonists in this story, However even they were written so well that I HAD to love them.